Upstate New York teens shine bright. This month, the Spotlight is on Danette Carll from Schenectady, New York. She has been working at miSci (The Museum of Innovation and Science) for almost three years, starting as a Volunteer, moving up into the position of Educator, then Education Program Manager, and now the Director of Education. She really enjoys her job and that shines through in her enthusiasm and dedication. 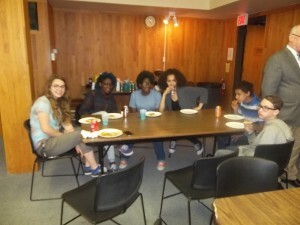 To start off, please, tell us in a nutshell about your Teen Café program, what’s special or unique about it? miSci is situated in the heart of “Tech Valley” in Schenectady. It is where General Electric originated. The Colleges of Nanoscale Science and Engineering are nearby in Albany. The Center of Gravity Makerspace is located in nearby Troy, and the semiconductor manufacturing plant GLOBALFOUNDRIES is located in Malta. As you can imagine, there are an immense number of manufacturing and technology companies and schools all around this area. Because of the numerous longstanding businesses, as well as many new operations, that are located in Schenectady and the surrounding areas, the Teen Science Café at miSci has an incredible pool of scientists to reach out to. The Café is also lucky to have an incredibly accomplished and interesting Board of Trustees at miSci. The Board Members are often interested in being Café speakers. For example, Dr. Marshall Jones recently gave a talk on the science of lasers. Because of the many new businesses coming to the area, there are many new families with interest in science who want something for their teenage children to be a part of. We have many parents who bring their teenage children (and their friends) to the Cafés and many times those teens will bring their sibling along when they realize how much fun they are. Zkara and Zané, a sibling team, initially came to the Cafés together and then became leadership members. They are an integral part of our Leadership Team. They are very active in the group, they reach out to amazing scientists, and they rely closely on each other to create projects and maintain communication with our speakers. Both of them attribute Teen Science Café to inspiring them to pursue a career in STEM. Zkara developed an interest in astronomy, as a result of our having had a lot of astronomy related Cafés, and Zané is interested in forensics and anthropology. One more thing that really makes our TSC here at miSci unique is that as part of a Science Center, the Teen Science Café has access to all state of the art equipment. Examples include 3D printers and MaKey MaKeys. We are able to use these types of resources as part of the hands-on component in our Cafés. Next month we have Dudley Observatory at miSci, with Outreach Astronomer Dr. Valerie Rapson as a speaker. She is going to present “Mars: The Wet Red Planet” and she’s going to use miSci’s planetarium to start the talk. It’s all very exciting! I majored in Anthropology and minored in Biology at the University of Albany, so I have had an interest in science for quite some time. About a year after graduation, I started working here at miSci and the Teen Science Café idea came around about a year and a half after that. It was very new and exciting. Two Board Members, Howard Hart and Larry Lewis, along with an Educator, Lauren McClelland, got it going after one of the three had read some literature on the Teen Science Café Network. I took it over from Lauren a few months into it’s inception, which was about a little over a year ago now. I am really enjoying it. 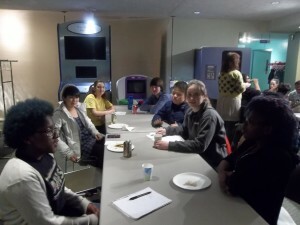 The Teen Science Café is one of my favorite parts of the job. I wish I had more time for it! miSci’s mission is to inspire people and explore science. A perfect teammate for the Teen Science Café. Your program has a home with miSci . . . how do you see it fitting with their mission? miSci’s official mission is to inspire people to celebrate and explore science and technology, past, present, and future. I think that our Teen Café program completely fits into that. The exceptional café presenters at miSci have truly been a part of that mission. The topics and speakers have been incredibly varied, but they are all alike in that they are either about science, technology, engineering, or math. You can’t talk about current topics in science without giving a bit of background and talking about what came first, so the speakers do a wonderful job of connecting technology of the past to the present and the future. For example, Lt. Nathan Stempel, while speaking on submarine science talked about earlier submarines, how they differ now, and that they might look like in the future. A really intense and exciting talk from Dr. John Delano covered the asteroid impact that caused the mass extinction of the dinosaurs. He explained how that knowledge is connected to our knowledge of asteroids now, current research in the field, and the likelihood of other asteroid impacts. He did assure Café attendees that they only happen every 100 million years or so . . . so we are probably pretty safe for a while! We had been around for an entire year and now we are starting to see turnover due to graduation, etc. While it was something we could foresee, we didn’t realize how much we would have to reach out to gain new members on the Leadership Team. I feel, after being here a year, I have a good sense of the ebb and flow of things, so that is something I can better prepare for in the future. We hosted an ice cream social with 3D printing and information about the Leadership Team to encourage new membership, but I realize now that we have to reach out throughout the whole year to really gain and keep members. A lesser issue, but still a challenge, is communication with the teens. Email is the easiest way for someone working at a museum day to day, such as myself, to communicate. For the teens, sometimes it’s best to text, which is more time consuming for me, but it’s effective so I do it! I like the teens! They are really fun to hang out with and very creative. I really like our setting – it’s cool to have a Café in the lobby of a museum. I think it helps with the informal nature of everything. Sometimes we have bean bags out and it’s just a really neat environment. Now that you have a year under your belt, do you have any advice for potential new members who are just starting up? Definitely use the Network! They are a great support system. Their resource bank and forums contain a lot of great information and experiences from people who have been there in your shoes. Instead of reinventing the wheel, just take the time to read about what worked for someone else and it might work for you. I strongly feel that icebreakers are an important component and I am trying to incorporate that into every meeting, as well as every Café. It helps to get rid of that awkwardness at the beginning. Music also helps. Thank you so much for your time, Danette, and your advice for new members and well-versed members alike!